5 pops out for the inbounds pass. 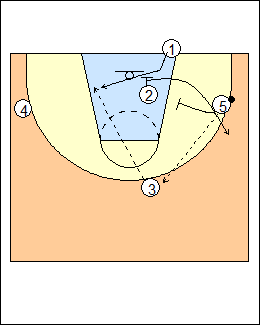 Post and pop - 1 passes to 5 and posts up. 5 passes to 2 and pin-screens 1 for a shot. See Inbounds - baseline Coastal Carolina (option d), Liberty, Spain high-low, Auriemma zone (2 can pass to 3, 1 comes out using 4). The player at the top slips to the basket for a pass, 1 comes in opposite the inbounds pass. Hold off on running a counter to an inbound play you have already used until the second half. 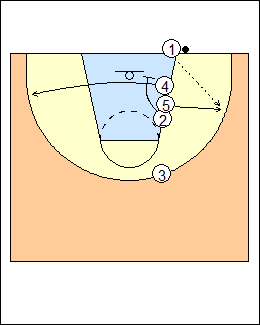 On the inbounds pass to 5, the player at the top downscreens for the inbounder. 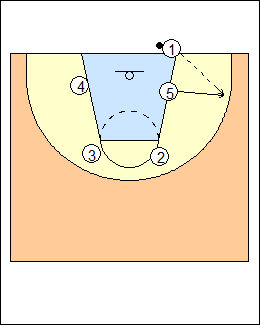 Tom Izzo - Chips box - 5 cross-screens for 4 who cuts to the ballside corner, 5 keeps going. 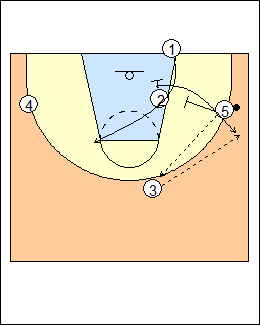 5 passes out top, the inbounder can curl or reject the downscreen, 5 pin screens for the screener. 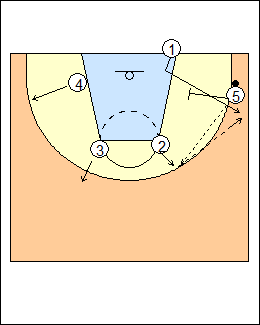 Can be used to isolate the inbounder on a flash to the high post after a downscreen and clear-out (down-clear). Izzo lob - 2 backscreens for 5. 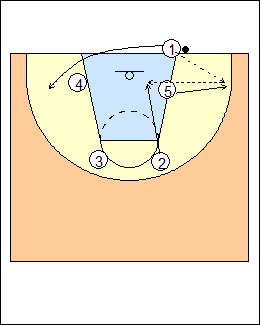 Screen-the-screener can be run out of a line formation. 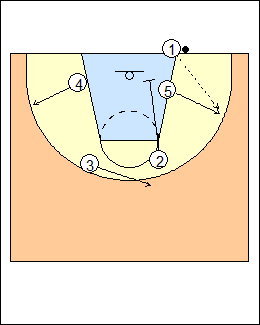 Here 1 curls the downscreen, 5 can come back to ballscreen on a pass to 2.